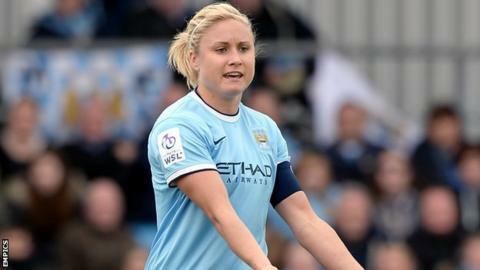 Captain Steph Houghton believes Manchester City Women will challenge for more trophies next season after they reached the Continental Cup Final. Houghton's side will face her former club Arsenal in the final after beating Chelsea 1-0 in Sunday's semi-final. City are competing in the Women's Super League for the first time this season and are currently sixth in the table. Houghton told BBC Radio Manchester: "We are a new team. It's a big step in the direction that we want to go into." The defender and England skipper, 26, was one of four England internationals signed in time for the club's WSL debut in 2014. She added: "We have made great strides since we started in January. The season has been a little bit up and down but we had a great result on Sunday. "We were desperate to get to the cup final, so that's a big positive for us. "I'm sure next season we will be a little bit more consistent in the league and challenging for more trophies." Striker Toni Duggan's 51st-minute goal was enough for Manchester City to see off Super League leaders Chelsea, who have beaten City twice in WSL 1 this season. Manager Nick Cushing added: "This trophy [would be] important for the evolution of this team. We want this club to be successful." Download the weekly podcast of BBC Radio Manchester's Blue Tuesday programme here.